While there are definitely a lot of gimmicks in the world that promise to regrow hair, yet are unable to produce any change, there are things you can do about your hair loss situation. Professional treatment at Greater Boston hair loss clinics that targets the underlying condition that causes thinning hair or baldness is what will provide you with the best results. South Coast Hair Options understands that there is no one-size-fits-all solution – no miracle in a bottle. If you have ever invested hundreds or thousands of dollars and weeks or months of your time using a so-called solution that your friends swear worked for them only to see no change in your situation, you are not alone. While bottle treatments may work for some specific types of hair loss, they do not work for everyone. When you come to our clinic, you will notice a difference right away. We begin by offering you a FREE scalp evaluation to determine the underlying cause of your hair loss or thinning hair. Once we know the cause of hair loss, which could be male pattern baldness, another type of hereditary condition, or even an issue caused by prescription medication, we can start working on a solution. Some clients respond well to laser hair therapy or one of our Corrective Hair Solutions (CHS) program options, which can vary between in-office applications to at-home solutions. Others may require benefits that can only come from our dermal lens system known as Virtual Reality, a system used by movie stars and other celebrities to ensure a full head of hair without having to wait for treatments to work. Low level laser therapy (LLLT) is a treatment that has been used by physicians and clinicians for the treatment of many different conditions with mixed results. 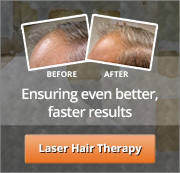 However, when it comes to laser hair therapy, such as the low reactive laser used at our Boston hair loss clinics, the results have been very encouraging. Used primarily in the treatment of telogen effluvium, laser hair therapy with the Laser Hair Therapy 5000 device is based on the scientific principle of photo biotherapy. These “soft” or “cold” lasers are not the type used by surgeons to cut or burn tissue but are used instead to provide damaged cells with light energy to stimulate metabolism and healing. Delivered at the appropriate wavelength, these photo biochemical changes in the cells can be achieved. Professional application of this tool for clients who have been diagnosed with this particular type of hair loss has shown to be extremely effective. At-home light treatments, such as those sold on late night television, cannot possibly replicate the results that come from a professional clinic that works to help regrow hair in the Greater Boston area. The high-energy output of laser light works to penetrate deep into the layers of skin where it is absorbed to start a photo biochemical chain reaction at the cellular and sub-cellular level. We do not just see success with laser hair therapy at our South Coast Hair Options location in New Bedford, but other clinical studies are proving it as well. European studies have been conducted that show a dramatic increase in micro-circulation of the blood supply in the areas that have received treatment. This has lead to a cessation of hair loss and stimulation of hair re-growth for many clients. Professors and physicians have studied the effects of low level laser therapy on hair growth since the 1950s, but it wasn’t until the mid-1980s that successful studies revealed hair growth in patients with alopecia areata who were treated with laser hair therapy. The results are clear: an increase in natural Keratin and the density of the hair follicle has been revealed in patients treated with laser hair therapy. This has been true in both male and female clients who suffer from stress alopecia and alopecia areata. An increase in hair growth has also been seen in patients with telogen effluvium at our clinic with the Laser Hair Therapy 5000 device. However, it is important to note that not all clients are candidates for this type of treatment. There is no one treatment that works for all types of hair loss. If you are interested in finding out if laser hair therapy or dermal lens system treatments might be right for you, contact our Boston hair loss clinics by calling 508-995-7085. We can schedule a FREE consultation and get you on the path to replace or regrow hair in the Greater Boston area right away.